I haven’t talked makeup brushes for a while haven’t I? This last post doesn’t quite count LOL! But I am still buying and using my brushes, it’s just that the slow down in my posting schedule means my blog real estate is really quite precious space these days. So I’ve put off telling you about the makeup brushes I use… until now. You see, I can’t put this one off any longer. I realised that I just HAD to share with you how much I love this little brush, after I realised that I didn’t like when I wash it and then have to use something else while waiting for this to dry. So, this is back-up material, this is! I bought this last year during one of the Sephora 20% off storewide sales. I passed the Make Up For Ever counter and for some reason, paused to peep at their (then) new brushes on display. For some reason, this one caught my eye and with a 20% discount making it even more attractive, I bought it. Make Up For Ever’s new Artisan brushes released last year are all of synthetic hair. This will please those of you who don’t like natural hair brushes or can’t use them for whatever reason. The bristles are very lovely and soft against the skin, which is quite normal for synthetic brushes. I personally am not into synthetic hair makeup brushes, which is why I didn’t pay a lot of attention to the new Artisan brush range. I mean, I like my makeup brushes, but I like them of luxurious natural hair because I feel it’s easier to work with them and they pick up colour better. But this MUFE 216 brush totally changed my mind. The brush head is quite small as you can see in the picture. It is however, fairly dense but soft and fairly pliable. The wooden handle is long, which won’t be useful for those of you who have to get close to the mirror (I know how it feels for short-sighted gals! I feel you I really do!) It is also fairly light but well balanced. The dense brush head is what makes this brush so amazing for me. It picks up powder product very easily and the small size allows it to deposit the colour very precisely. The pliable bristles then allow this brush to blend the colour easily. 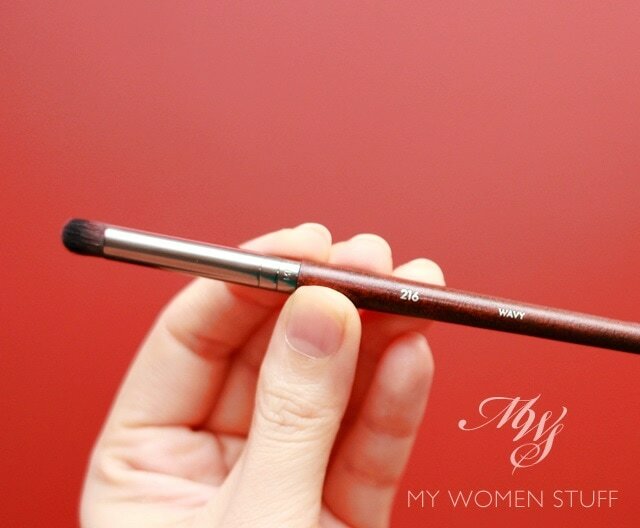 I use this MUFE 216 brush to apply crease or contrast colour. I don’t have a defined crease, so it’s not that easy to create contrast in my eye looks. However, the day I got this small wonder, all problems ceased. The size of the head is just right to fit into the hollow of my lid to create a “crease” and to provide shading on the outer part of my lid. The dense head also allows me to use this brush to apply colour along the upper lash line. Not a defined line, but when I want a soft but defined contrast colour along the lash line, I use this. 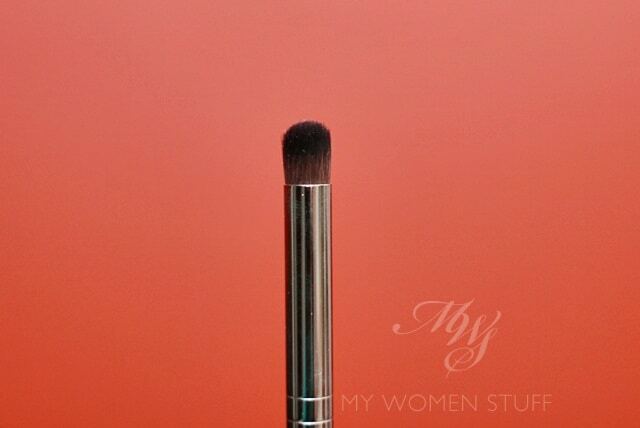 If I want a contrast crease shade, or a contrast shade on the outer lid, I use this brush. In fact, I use this brush everyday because it’s just so easy to use, blends colour so well and is basically fool-proof for me! The Make Up For Ever 216 Medium Precision Eye Blender brush makes a perfect blending tool for applying contrast colour to the crease for me. The size, density and pliability also makes this perfect for those who do not have a defined crease like me, or who don’t have a lot of eyelid space for applying colour. This brush deposits colour precisely and blends it out beautifully. I use this almost everyday and feel lost without it when I have it drying. I think I need another! Have you tried any of the new Make Up For Ever Artisan brushes? Do you use a brush similar to this one? I’m always on the hunt for brushes to help with the small lid space issue. I’ve tried just about every brush before finding the best ones to suit my needs which are never the same as what the majority of people use. The MAC 217 while nice is just a tad too large for me but the Sigma E25 is perfect. This looks similar to the Sigma E39 which is what I currently use to achieve the same thing. I’ll have to check It out next time I’m in Sephora. does it say on the package or brush, where it’s made in? I am so glad to read this cos I recently bought the 152 cos I was asking the SA for a good blush brush. And although I read somewhere that the 152 is supposed to be for highlighting, i think it is perfect as a blush brush for me cos it is small enough. And soooo soft! I want to get another! And now this is on my list. Lol. You have me intrigued, Kim! I shall have to check it out in store next time 😀 If you suffer from little lid space like me or the lack of a crease, I think you’ll like the 216 too! 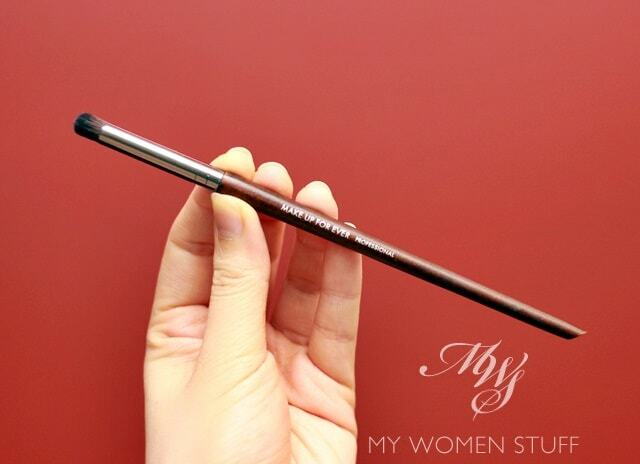 My favourite blending brush is one from Sephora themselves, which looks like something slightly bigger than this one. I usually prefer natural hair (except when working with cream products) but this one does look interesting. 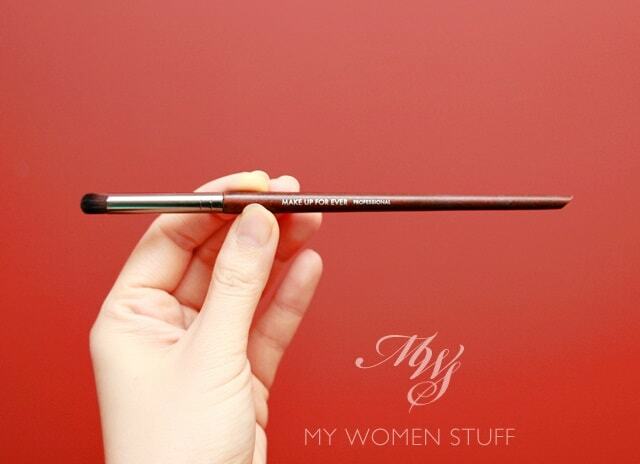 Oooh this reminds me of Makeup Geek’s outer V brush! Haven’t tried this one but MUG’s is good. Have you tried them out? They’re actually pretty good! How is this brush compared to MAC 239. I never tried high end brand crease brush b4. So far for crease brush I m liking the 1 frm etude house, can’t remember the name n also 1 from colour cosmetic Malaysia. That does look like a nice brush! We’ve just got MUFE here so I may have to make the pilgrimage to Oxford Street to look! Finally! MUFE in the UK! It’s about time, really 🙂 Also check out their new eyeshadows. Sublime! Definitely waiting for a sephora sale for this! I just picked this up at changi airport for sgd 33..still slightly cheaper after the dratted conversion. In case any ladies are heading this way & want to pick this up. ??? ?